Cabalistic writer; author, or redactor, of the Zohar; born at Leon, Spain, about 1250; lived in Guadalajara, Valladolid, and Avila; died at Arevalo in 1305, while returning to his home. He was familiar with the philosophers of the Middle Ages and with the whole literature of mysticism, and knew and used the writings of Solomon ibn Gabirol, Judah ha-Levi, Maimonides, etc. He knew how to charm with brilliant and striking phrases without expressing any well-defined thought. He was a ready writer and wrote several mystical and cabalistic works in quick succession. In the comprehensive "Sefer ha-Rimmon," written in 1287 and still extant in manuscript, he treated from a mystical standpoint the objects and reasons for the ritual laws, dedicating the book to Levi ben Todros Abulafia. In 1290 he wrote "Ha-Nefesh ha-Ḥakamah," or "Ha-Mishḳal" (Basel, 1608, and frequently found in manuscript), which shows even greater cabalistic tendencies. In this work he attacks the philosophers of religion and deals with the human soul as "a likeness of its heavenly prototype," with its state after death, with its resurrection, and with the transmigration of souls. "Sheḳel ha-Ḳodesh" (written in 1292), another book of the same kind, is dedicated to Todros ha-Levi Abulafia. In the "Mishkan ha-'Edut," or "Sefer ha-Sodot," finished in 1293, he treats of heaven and hell, after the apocryphal Book of Enoch; also of atonement. He wrote as well a cabalistic explanation of the first chapter of Ezekiel. Toward the end of the thirteenth century Moses de Leon wrote or compiled a cabalistic midrash to the Pentateuch full of strange mystic allegories, and ascribed it to Simeon ben Yoḥai, the great saint of the Tannaim. The work, written in peculiar Aramaic, is entitled "Midrash de R. Shimeon ben Yoḥai," better known as the Zohar. The book aroused due suspicion at the outset. The story runs that after the death of Moses de Leon a rich man from Avila offered the widow, who had been left without means, a large sum of money for the original from which her husband had made the copy, and that she then confessed that her husband himself was the author of the work. She had asked him several times, she said, why he had put his teachings into the mouth of another, but he had always answered that doctrines put into the mouth of the miracle-working Simeon ben Yoḥai would be a rich source of profit. 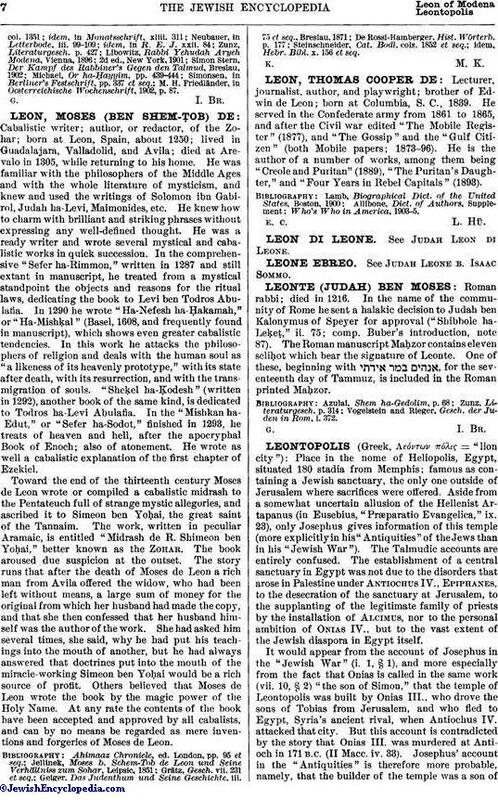 Others believed that Moses de Leon wrote the book by the magic power of the Holy Name. At any rate the contents of the book have been accepted and approved by all cabalists, and can by no means be regarded as mere inventions and forgeries of Moses de Leon. idem, Hebr. Bibl. x. 156 et seq.